2019 and the Resurrection of my Blog! It's been FOREVER since I blogged here but with all of the craziness on social media, I feel like blogging may be a less stressful way for me to 'socialize' on the inter-web and get my art out there. I also gave up my website since it was expensive and I almost never updated it so I will be posting new art and classes on here and using my Etsy shop again for sales. 2019 will be all about making things LESS stressful, not adding more to my plate. I will still be posting on Facebook and Instagram and having craft parties in my home. Here's what we'll be making on January 18th. I'm so in love with these peg dolls. SO many possibilities and they're CUTE! I'm off to drop off some RBG prints to a couple of local shops! It's been a while since I've updated my blog but I promise you I haven't been lounging about. 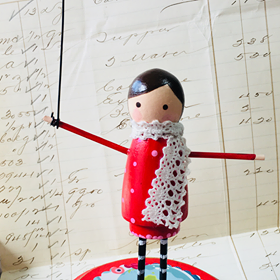 In this fun workshop, you will be painting a hand sewn and stuffed muslin doll form and then creating beautiful wings from wire and vintage bible pages. You will learn to give your angel an antique wash to give her some age and then a sprinkling of glitter to give her some magic! No artistic ability needed, just the desire to be creative and have fun. Click on the "Classes and Workshops" tab under the blog banner for all of the workshop details. Then click on the BUY NOW button over on the right side of this blog to pay for your course. After receiving payment, I will contact you with a confirmation! Tomorrow I leave for my annual Sister's Weekend in Adamstown, PA. If you have been reading my blog for a few years, you know how much I look forward to this trip. Usually it's just my sister and myself but this year we are bringing our honorary sister, Marie! 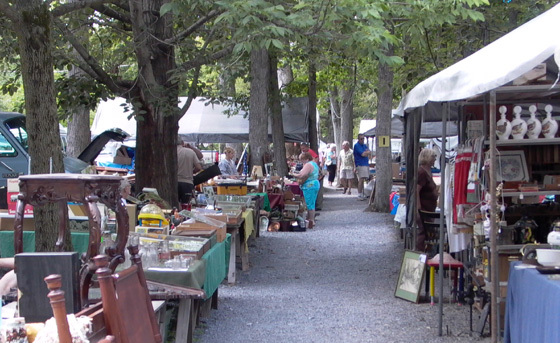 We LOVE to hit the outdoor flea markets like Shupp's Grove and Renningers in Kutztown. At night we visit a lot of the indoor antique malls. Our favorite is Mad Hatter Antiques. 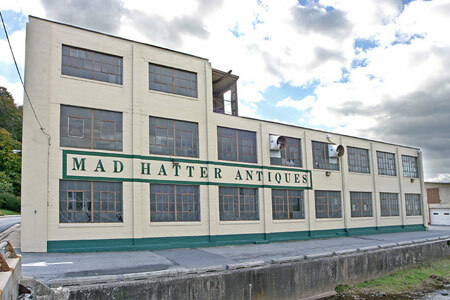 It doesn't look like much from the outside but the inside is FABULOUS! Filled with tons and tons of booths. Silly pictures of us at Mad Hatter last fall. I want to fix up my garden shed. I was thinking of painting it a pretty periwinkle blue with the white trim and maybe cherry red doors. I had the brilliant idea of decorating﻿ the front with vintage dishes in pinks, whites and reds, but I have boys who repeatedly hit the shed with baseballs so that's not going to work. Plan B may be hanging vintage garden hand tools. Or maybe I'll just wait and see what inspires me while I'm away. My garden is finally starting to grow into itself. Many of the things I have planted are in their third and fourth year. The vines and roses are finally climbing the trellis and you can see less and less of the mulch in the flower beds. I will share pictures when I return! I hope it is as beautiful where you are as it is here! I've been spending a lot of time outdoors getting the gardens in shape but I managed to finish a couple of paper fish this week. Even with the boy's home for spring break! I picked up this tray a Goodwill for a few dollars. 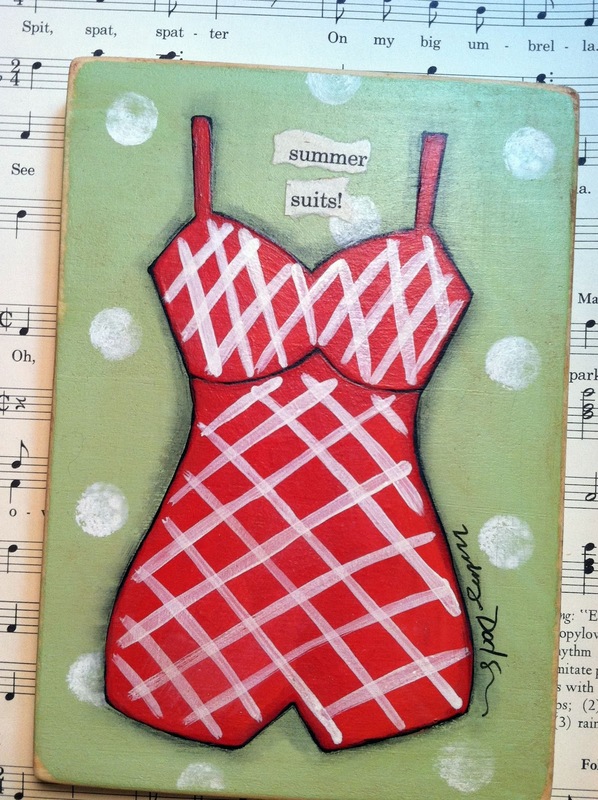 I love the idea of doing my paintings on recycled items. It just makes it more fun and interesting to me. 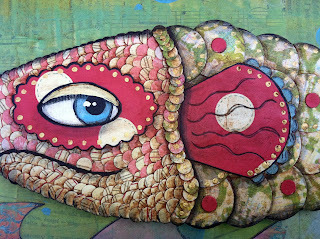 Here is a pic of the detail in the fish. This is a fun one that I did on ﻿a piece of scrap wood. I also added some gold thumb tacks for a little "bling." 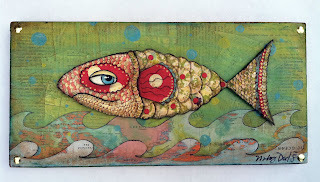 I"m thinking of doing a few more fish and then I'll add them to my shop. It's been a long time since I have added anything new to the poor old Etsy shop. I wanted to stop by and announce a fun new mixed media workshop that I will be teaching on Saturday,May 5th, 2012. 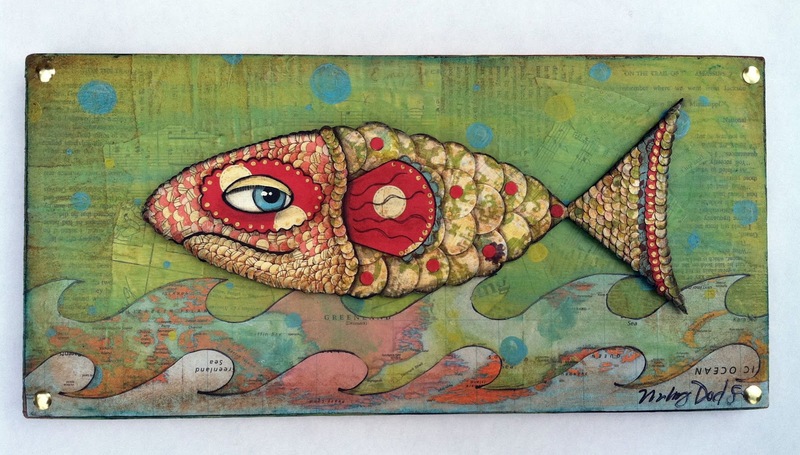 In this exciting class you will learn the versatile technique of decoupage as well as a few other mixed media techniques. Decoupage is a medium where glue is used to attach colored paper and small objects to another object. In this project we will be covering and decorating a large 25” dress form/jewelry mannequin. 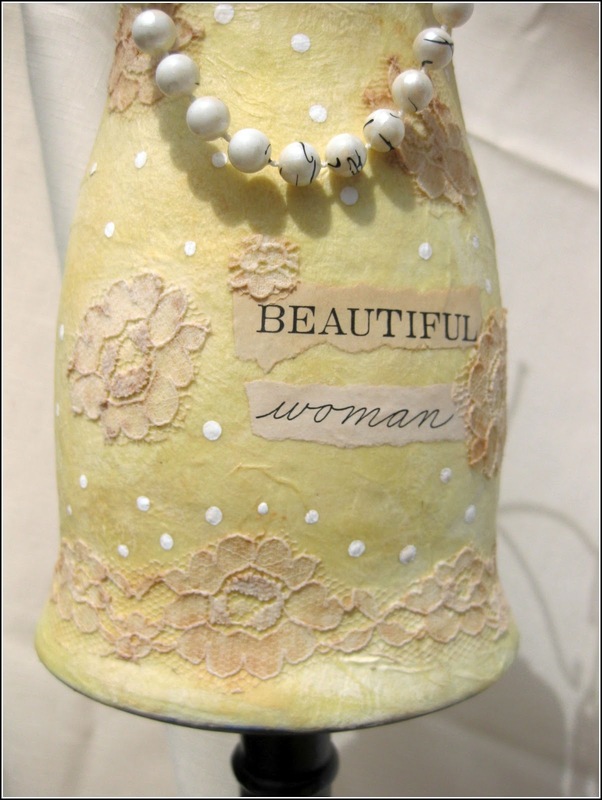 You will also learn to use an antique wash and how to incorporate found objects in your project. 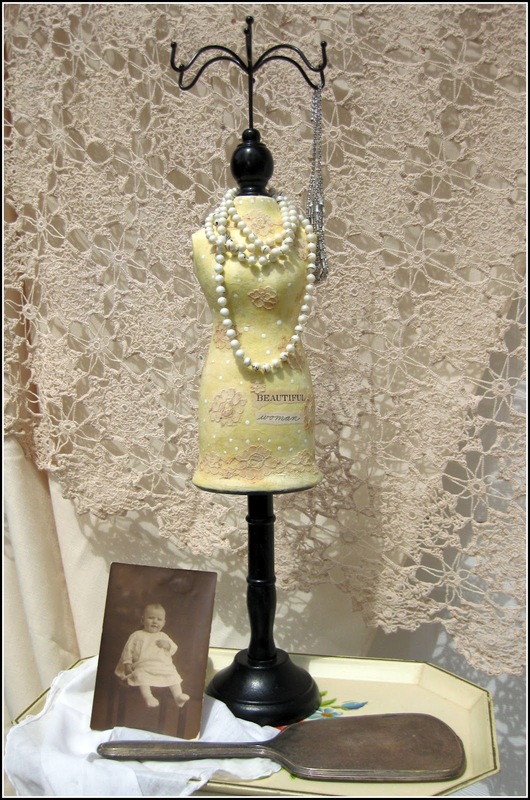 Here is a close-up﻿ showing some of the detail we will be adding with vintage lace and text. This is a 3 hour workshop that will be held at Home Fine Art Gallery in Mt. Holly NJ. 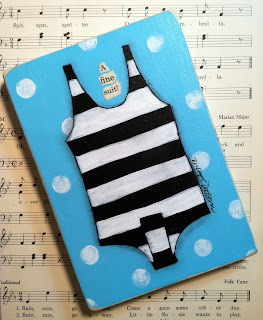 The workshop fee is $55 and that includes all supplies needed to make this project. Snacks and beverages will be provided but feel free to pack a lunch to eat during our break! Click on the Classes and Workshops tab above for more information and registration details. I added a few new goodies to my shop. First, I made a new brooches. I had a few of these for sale at the art gallery I belong to and decided to do some for the shop. The face is made from polymer clay that was baked, sanded and then painted with acrylics. I attached the face to a round of felt and added some hand stitched detail. The pin on the back is also hand sewn. Each brooch is signed and dated on a little tag in the back. 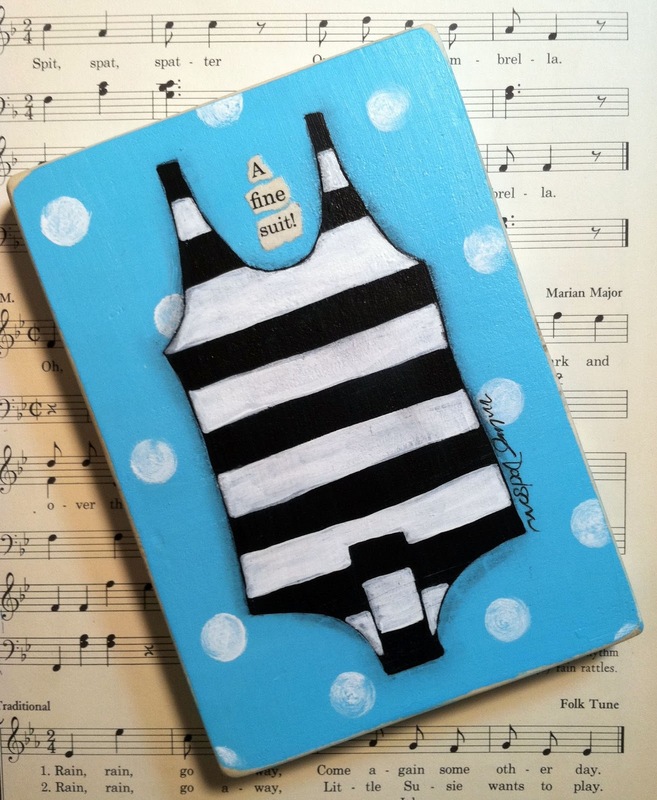 I also did a couple of vintage bathing suit paintings. They are 5x7 on wood blocks. ﻿They are available in my Etsy shop right this very, very minute!! That's it for today....I'm pooped.